Author’s Note: Hello readers! I’m Josh O’Brien. I recently joined the Science team as a junior engineer, and this is my first post for the blog. One of my first tasks with the Science team has been learning to write effective analytics SQL. I came in with a basic knowledge of SQL, but writing complex analytics reports required me to learn tools and strategies for managing complexity that aren’t yet part of the standard introductions to SQL. Luckily, I had the Science team to teach me to work with Common Table Expressions (CTEs). I’ve come to love CTEs for the clarity that they’ve helped bring to my thinking and writing in SQL. The CTE syntax encourages me to reason through a problem as a sequence of simple parts and enables me to directly code a solution in terms of those parts, which I can individually document and test for correctness. Working with CTEs has jump-started my productivity, and helped the team as a whole set a higher standard for our SQL. In the Science team’s experience, much of the common frustration with SQL comes down to a failure to treat SQL queries as declarative programs that demand the same care as imperative programs. SQL is code, and we should treat it as such. We can better manage the complexity of SQL by using the same basic techniques we do in other languages: we can divide work into composable parts, document our intent, and test for correctness. We use CTEs as a foundation for building queries that are factored, documented, and tested, and we’ve enjoyed excellent results writing and maintaining numerous hundred- and thousand-line reports using this approach. In this post, I’ll share an example of how the Science team uses CTEs to treat SQL as code. I’ll walk through the process of writing an analytics report with CTEs, and show how CTEs help me think through a problem and implement, document, and test a solution. * If you’re thinking that CTEs are no better than temporary tables or views for these purposes, read on. CTEs, temporary tables, and views all have their place in our SQL toolkit. We use CTEs because they are best suited for this work. For more on the relative merits of CTEs, temporary tables, and views, please see the appendices to this post. Before we dive into the example report, let’s take a quick look at the CTE syntax we’ll be using. CTEs are defined inside of a WITH clause attached to a primary statement. Within the scope of the larger query, each CTE can be manipulated like a table. This allows us to chain CTEs together and build sequences of operations. In the following diagram, we’re building up a four-part query, part by part. We start with two parts: a foo CTE attached to a main SELECT statement. Next, we add a bar CTE. In the final step, we add a baz CTE to complete the four-part query. Examples of two-, three-, and four-part queries with Common Table Expressions. The query grows by one CTE at each stage. Notice what we did here. In the foo, bar, and baz CTEs, we now have three intermediate result sets that we can test individually and “print” with a SELECT *. Once we know each part is correct, we add another, until we’ve solved our problem. We can use CTEs to break queries into as many simple parts as the problem requires. We use CTEs rather than temporary tables or views to decompose queries in development because they are simpler to use. There is no need to add the complexity of managing CREATE and DROP statements at this stage in the writing process. We’ll use a simplified example report to illustrate how we use CTEs in our everyday work: a frequency report. A frequency report is an online advertising analytics report that helps advertisers determine the number of ads to serve users over a specific time period. Advertisers want to reach out to customers enough times to build awareness of and interest in their offerings, but not so many times that customers become jaded or annoyed. A frequency report breaks down return on advertising investment by the number of ads users have been shown, a classification known as a user’s impression frequency class. An example of a report in our UI, showing impressions for an advertiser by frequency class. The challenge of writing these reports comes from managing all the additional data we need. Actual reporting queries need to correctly handle the complexity of timestamp, ad campaign, conversion attribution, click, and cost data without becoming tangled messes. Our task: use the impressions, clicks, impression_attributed_conversions, and click_attributed_conversions tables to produce a frequency report for the month of March 2014. Working with CTEs begins with reasoning about the problem in terms of the stages and parts needed to produce the report. From the above starting point, we can already work out four main stages. 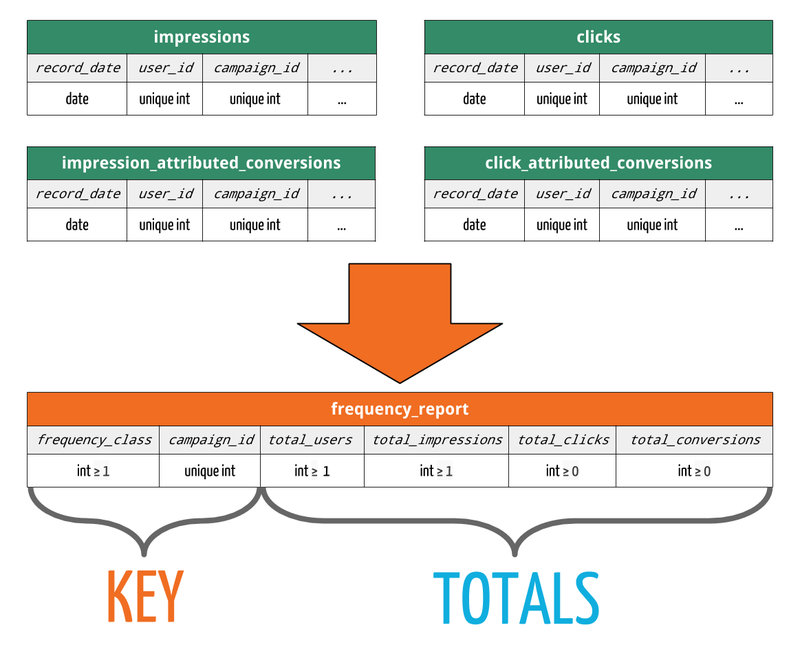 GROUP BY impression_count (= frequency_class) and campaign_id, and SUM to generate the report totals for users, impressions, clicks, and conversions. A map of the query to produce the frequency report. Each of the conceptual parts connecting the green input tables to the orange frequency report will be written as a simple CTE. In one form or another, each of these operations would need to be a part of any query that produces this report. With CTEs, we can preserve the logical clarity of our thought process in the code itself. Each of the main parts of this query will be implemented using simple CTEs that serve only one main purpose. For added clarity, we will name and comment the CTEs to communicate our intent at every stage. This technique yields a query that we can read straight through and maintain with ease, just like our other code. Let’s take a look at a CTE from each stage right now. The full query with documentation comments can be found here, and in the appendices to this post. We write and comment one CTE at a time in the test file. Each time we add a CTE, we add test rows to exercise that CTE to the setup file, and include comments to indicate what should happen to those rows when we SELECT * from the relevant CTE. When the output matches our expectations, we move to the next part of the query, and repeat the process. This basic testing at the time of writing is not a substitute for a comprehensive test framework, but it is enough to catch many errors that could otherwise sneak through, and it provides a good return on a modest investment of effort. By the time the full query is complete, this process will have generated tests and documentation for each part of the query. This method of working with CTEs has helped me by bringing clarity and simplicity to complex analytics queries. Thinking, writing, and testing with CTEs helps me treat SQL as part of software engineering practice by writing SQL that’s factored, documented, and tested more like other code. The Science team thinks of this method as producing a foundation for further refinements. When appropriate, optimizations for performance can and will be made, but we focus on correctness first. 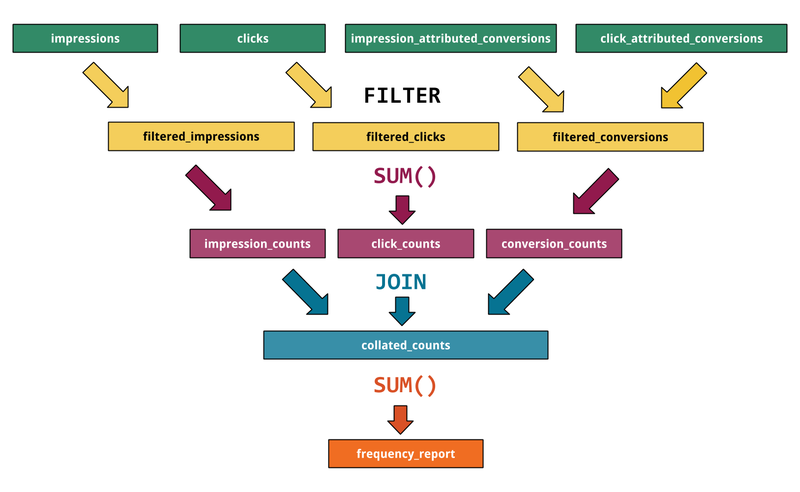 Optimizations tend to add complexity, and before we do that, we want to mitigate the complexity of the query as much as possible. By starting with CTEs, we can more easily write queries that we can quickly read and reuse six months from now. Analysts can return to their models and analyses with confidence and engineers are better able to add new features to reports without introducing new bugs. We’re building upon a foundation of factored, documented, and tested SQL. depending on the way the CTE is used. can be rewritten, join clauses moved around, etc. sets, this can be essential for good performance. We agree that the choice between CTEs, temporary tables, and views is a matter of balancing the different trade-offs of the different stages of software development. As explained in this post, the Science team finds the balance in favor of CTEs as the foundation for query development. We reach for the CTE syntax first for its clarity and ease of use. When we write and test queries part-by-part, we want to keep the code as clear and simple as possible. Juggling extra CREATE and DROP statements for temporary tables or views works against that goal. Once we have a correct, clear foundation, then we move onto the optimizations I mentioned in the conclusion. At that point, we consider re-writing CTEs as views or materialized tables on a case-by-case basis. Sometimes the balance tips away from CTEs. In our experience, the most common reason for this has been to gain the performance benefits of indexing on intermediate result sets that can contain hundreds of millions to tens of billions of rows. We’re happy to announce our newest open-source project, java-hll, a HyperLogLog implementation in Java that is storage-compatible with the previously released postgresql-hll and js-hll implementations. And as the rule of three dictates, we’ve also extracted the storage specification that makes them interoperable into it’s own repository. Currently, all three implementations support reading storage specification v1.0.0, while only the PostgreSQL and Java implementations fully support writing v1.0.0. We hope to bring the JS implementation up to speed, with respect to serialization, shortly.